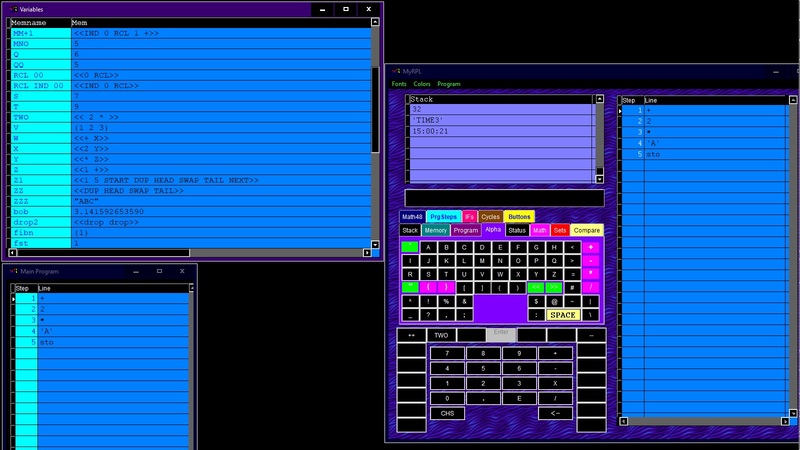 I wrote my first HP 41 emulator for DOS operating system at years 1994-1995. The emulator was published on Internet at 1995 . 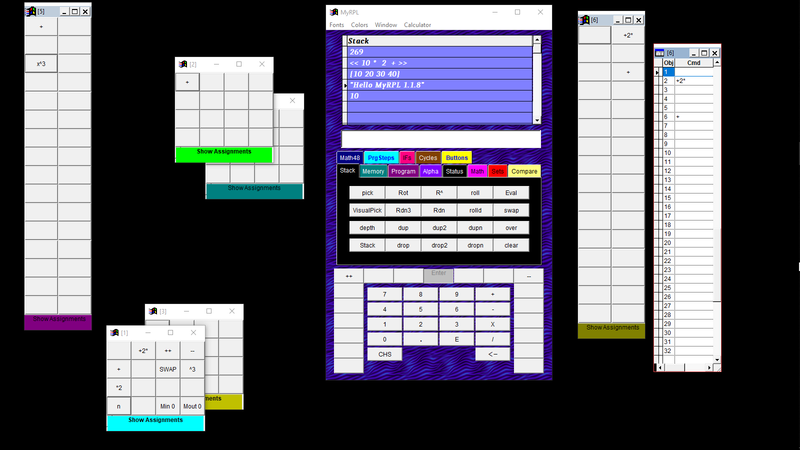 I created "The hp41 emulator page" on www.geocities.com at year 1995. Since 2009, geocities.com is off line, so , I translated the html pages here. 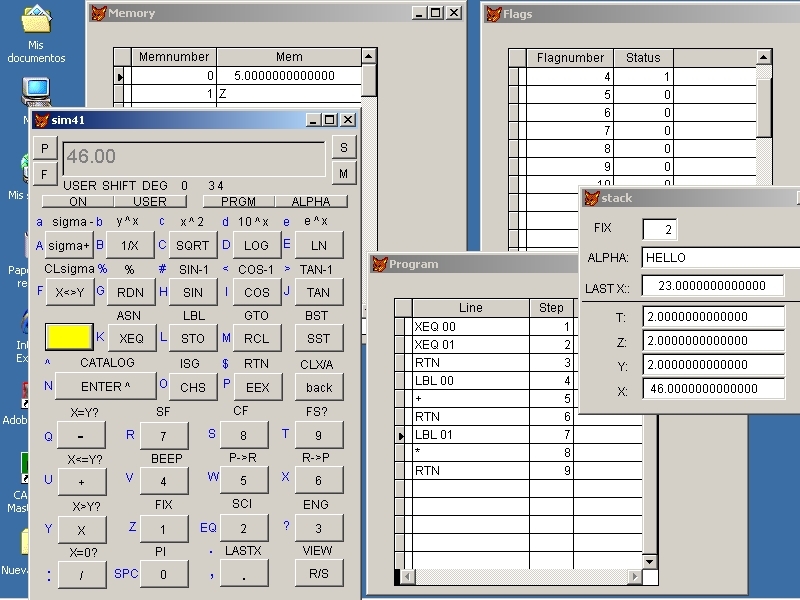 At year 2004 I began to write an HP41 emulator for Windows, updating the old DOS code. I began to write the MyRPL programming language at year 2016. You will find all these programs here. Comments and questions welcome . Please, excuse errors in English usage. You need a computer with windows 10 and at least 4 Gigas of RAM. 1) Download and Install VirtualBox. 2) Download the windows 7 image. Select: Virtual machines. Choose the machine and download it. 3) Import the image to virtualbox. For example: navigate using IE8 provided in the virtual machine. 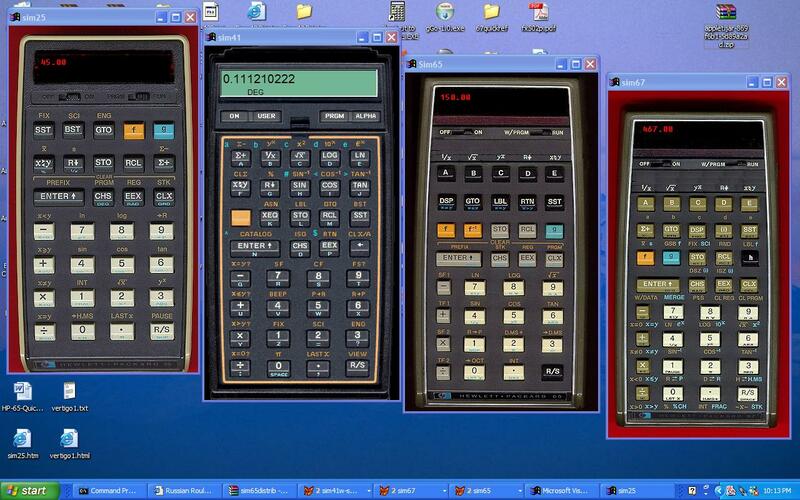 6) Download and Install the calculators or MyRPL on the win7 image. 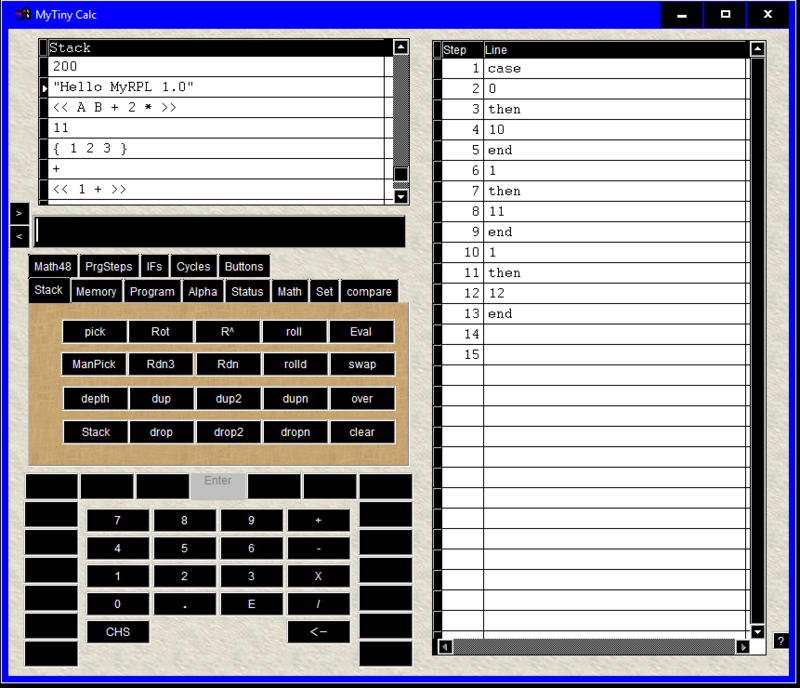 The game of NIM adapted from original code for the HP25 calculator. Printing all allocated memory registers using the PRX command. Currently I am updating often all these emulators. 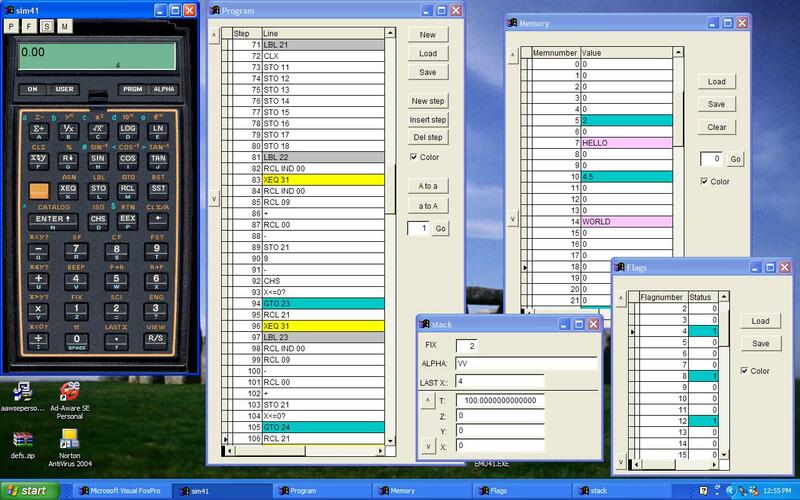 At september of 2010, I began to write an emulator for the Texas Instruments TI59. Nigthly binary 2019/02/28. Experimental: Load Stack, Load Memory. Fixed a problem in Msize. Version 1.18b: Testing new panels intented for assignable buttons. Version 1.17b. New "panels" technology. VERSION 1.17a FIX. THE ASSIGNED KEY "--" DO NOTHING AND SHOWS AN ERROR. Fix: Open the variables window. Search for a variable name "-a". Change to "--"
Version 1.16e. New: Multiple assignments to several keys. Fast method to assign keys. Use View in the Buttons sheet. Assign several variables to some keys at the grid shown. Save pressing CTRL and W at same time on the PC keyboard. Version 1.16d. Shrink and Expand the calculator. Show/No Show assignments. entry box. Use either the keys Enter or Eval at the end of each command. Version 1.16b: New menu options. New window to show variables. Some fixes. 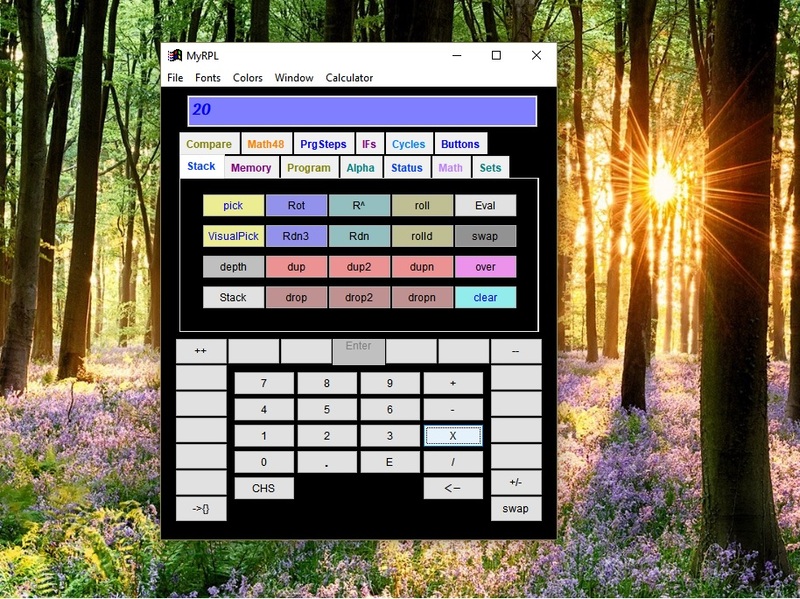 View a screenshot using a High contrast Theme on Win10. 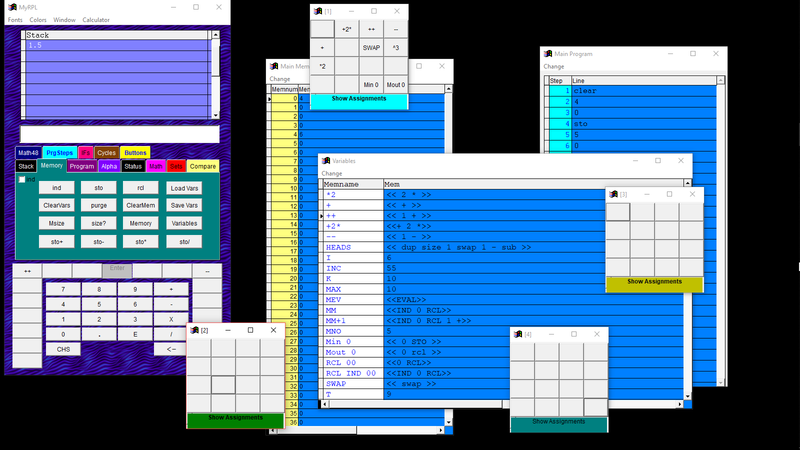 From version 1.16: Redesign of Alpha sheet. Included some tooltips. New method to load on windows10. The compatibility with vrunfox6 is only from version 1.16. I changed internal code to do this. Version 1.15d: The commands SECONDS and TIME could be written manually on the entry box. Use ENTER to execute them. SECONDS puts on the first level of the stack the seconds from midnight. TIME puts the current time. 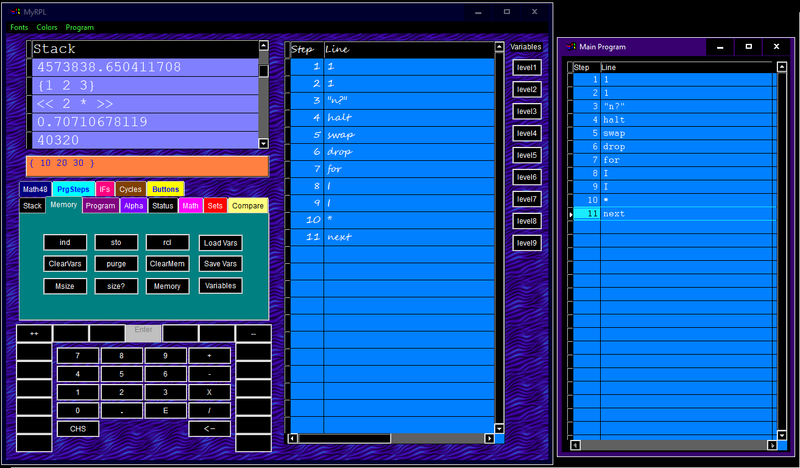 From version 1.15c: A command could be written manually in the data entry box. Use either the Enter key or Eval key to execute the command. The PC enter key also could be used. over the stack level where the object is saved. From version 1.15a: Included memo fields in Main Memory and Variables Memory. A memo field could be used to save objects with hundreds of Kilobytes. 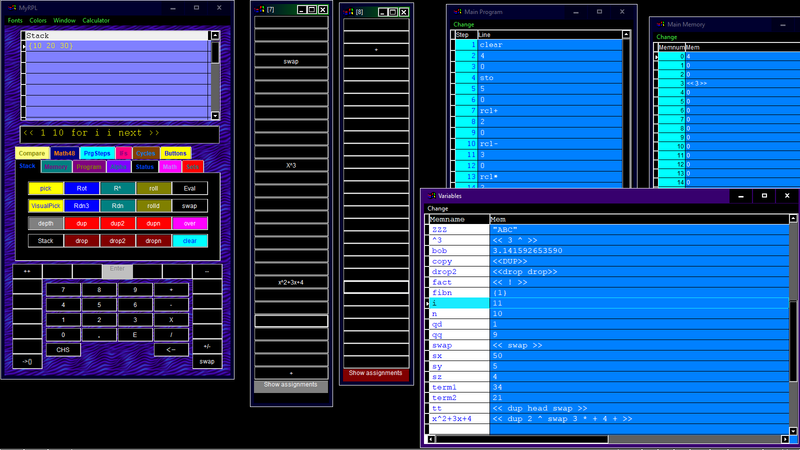 Skin manager for sim59 developed by Pierre Houbert_available at his site ti58c.ift.cx , Emulator, Other products.